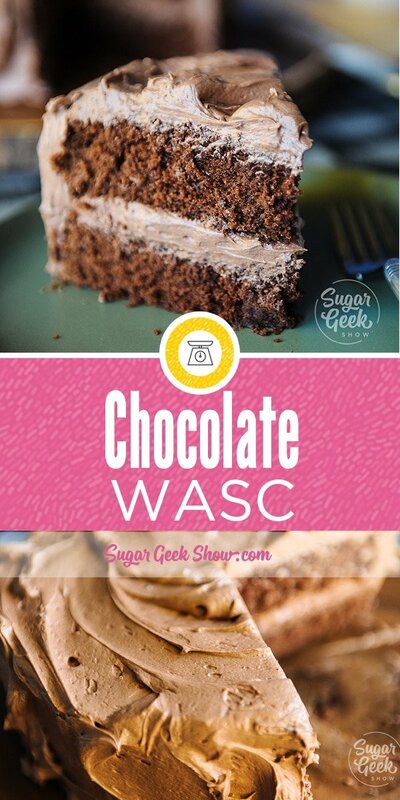 Chocolate WASC is the chocolate version of our popular WASC recipe that with an addition of a few ingredients, your box cake will taste almost like scratch. The texture is light and fluffy but is still sturdy enough to carve a cake or stack into for a wedding cake. 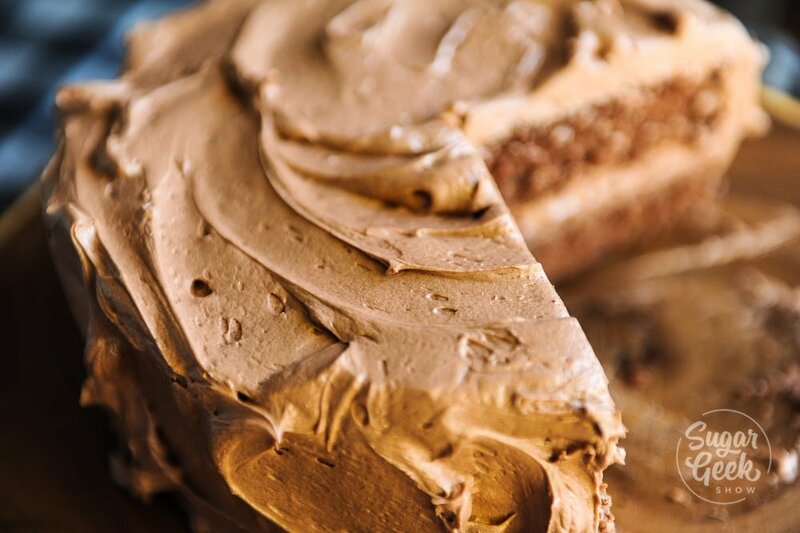 Chocolate WASC is a great option if you’re not quite ready to take the plunge into baking a chocolate cake recipe from scratch. One of the ingredients that makes this cake so dang good is the sour cream. It adds a nice tang to the flavor and an extra level of moistness. 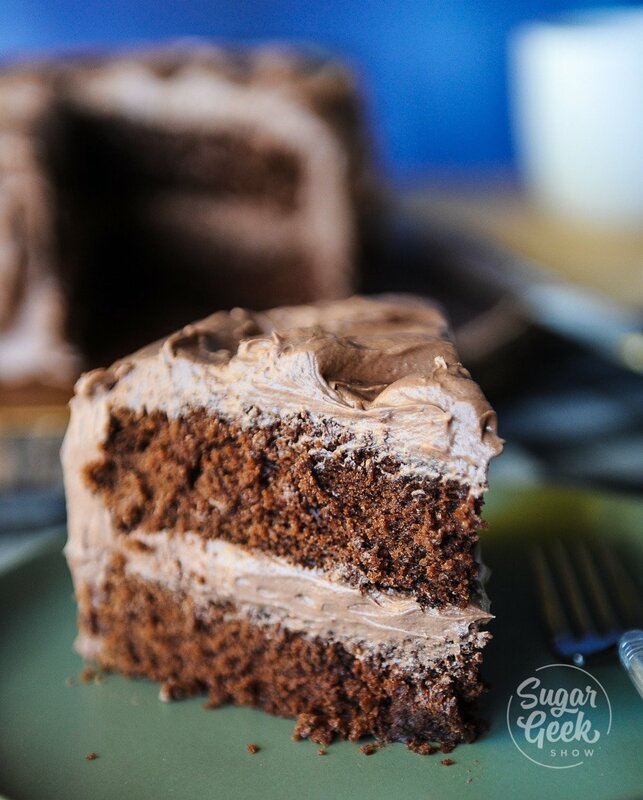 Sour cream is a popular ingredient used in a lot of chocolate cake recipes giving it a similar flavor that you might get from using buttermilk. I like to use coffee as my liquid instead of water because the coffee brings out the chocolate flavor. Your batter will smell like strong coffee but don’t worry, it won’t taste like coffee. You don’t have to use coffee, you can use water or even milk if you want. Chocolate WASC starts with a nice chocolate-y box mix. I usually use Duncan Hines chocolate fudge cake but devils food cake will also do nicely. Just pour the contents of the mix into a bowl and add in your extra ingredients. Just ignore the instructions on the back of the box and use the recipe below instead. Mix all your ingredients together until combined and then mix vigorously for two minutes. I used a stand mixer with a paddle attachment but you can also just use a bowl and a spoon. I tweaked this recipe to contain melted butter so that when you chill it the cake is a bit firmer and easier to handle. This recipe works great for cupcakes and rise up perfectly. I get about 36 cupcakes from one box. 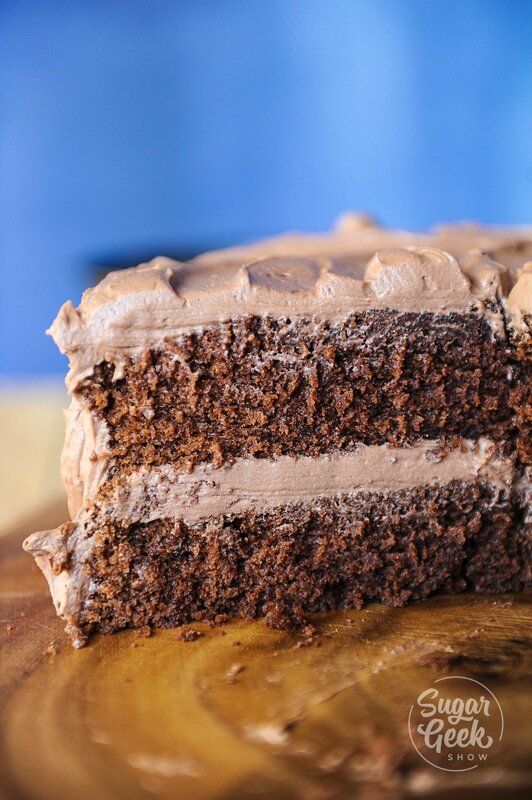 I like using my chocolate buttercream for this recipe. The yummy flavor pairs perfectly with the chocolate cake without it being too heavy. 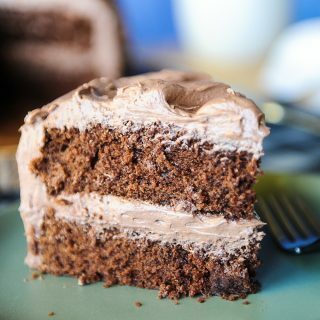 If you’re looking for other yummy chocolate cake recipes, check out my guinness beer cake which is the epitome of decadent. This is the chocolate version of the WASC recipe. Starting with a box mix and adding in some extra ingredients, you can get a great tasting cake in a flash that tastes almost like scratch. Shhh I won't tell. This recipe makes two 8" round cakes that are 2" tall. Preheat oven to 335℉. Prepare two 8" round cake pans. I prefer to use cake goop. Add all dry ingredients into the bowl of your stand mixer with a paddle attachment. Add in the rest of your ingredients and mix on low for 1 minute. Stop and scrape the bowl and then mix on medium for two minutes. Pour batter into your cake pans and bake for 25- 35 minutes until a toothpick comes out of the center with just a few sticky crumbs clinging to the toothpick. Let cool a few minutes in the pan before turning out onto a cooling rack. Let cool fully and frost. Thank you so much! If you wouldn’t mind leaving a star review I would super appreciate it! What size cake mix are you using? 18.25 or 15.25??? Some recipes are older and they’re using the 18.25 oz box mix. Cake mixes are 15.25 oz now. I don’t think it makes a difference. Funny how these cake box mixes are so full proof! I have even accidentally left out the eggs and it magically still baked up! I must know, why the cold coffee? Hello Lis, thank you for sharing your yummy recipes 🙂 … I am confused in the measurements in the flour and sugar says 4 oz and next to that 1 cup and the sugar says 5 oz -1cup … are both a cup or is a 1/2 cup? I am not a pro but I thought 4 oz are more close to 1/2 cup … thank you so much I tried already two of your recipes and are AMAZING! Hi there. 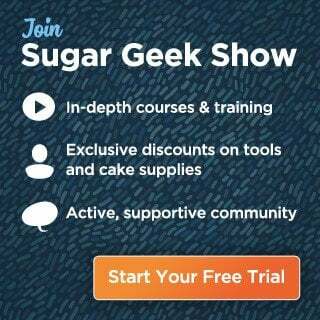 Flour and sugar have different volumes (cups) which is why I have listed the weight for accuracy. Example: 1 cup of water (8oz) is not the same as 1 cup of flour (4oz) because one is light and fluffy and one is liquid. Hope that makes sense. Alrighty, then. Who wants to decipher WASC for me?! Thank you, it’s driving me crazy! Excellent! Very moist! Thank you for the recipe! I needed an easy quick recipe and made this. It was amazing! Super moist. Everyone loved it. Thanks Liz for sharing this, I will definitely be using this recipe again. I was wondering though, can I add more cocoa powder and if so how much do you think?